I encountered ninja a while later, through the James Bond film You Only Live Twice and then in the pages of Oscar Ratti’s Secrets of the Samurai: A Survey of the Martial Arts of Feudal Japan (which I checked out of the Boulder Public Library so many times my father finally bought me my own copy). Ninja may not have seemed to me at the time to share Shaolin monk Kwai-Chang Caine’s spiritual dimension, though they undoubted had much cooler gadgets. But nevertheless, in some important ways, the stage was set for me by the time I was 12. And yet – it took another three decades, and becoming a parent, and a whole bunch of moderately crappy experiences for me to take the first steps on the path. I have devoted enough time to contemplating why this was so that I am able to say with great confidence that I’ll never understand in any significant way the process that led to that first step. But I took it. And now, going on five years later, I have the opportunity to reflect on what it means, even if I can’t say why I have traveled as far as I have. the next time you encounter fear, consider yourself lucky…. The trick is to keep exploring and not bail out, even when we find out that something is not what we thought. That’s what we’re going to discover again and again. Nothing is what we thought. I can say that with great confidence. Emptiness is not what we thought. Neither is mindfulness or fear. Compassion - not what we thought. Love. Buddha nature. Courage. These are code words for things we don’t know in our minds, but any of us could experience them. These are words that point to what life really is when we let things fall apart and let ourselves be nailed to the present moment. I had no idea how afraid I was until I started training in To-Shin Do. I think I may have been vaguely aware that I lived with an enormous distaste for conflict, and was willing to go to about any length to avoid it. It took hundreds of hours of mat time, and at least as much time musing on my reactions, for me to understand that almost everything I’d done in my life had been to avoid situations of conflict: personal, emotional, physical. And so it was a shock to me to discover how right Pema Chödrön was: all of those hours on the mat, learning to deal with the biomechanics of physical conflict began to coalesce, and I discovered that conflict and antagonism were not what I thought. Nor was courage. And it is still humbling to contemplate that there did not seem to be any way for me, personally, to come to that realization except for all those hours of being in my body, in that particular place, working on my kamae. And that it was never anything I could have done on my own. Reflection has clarified that matter for me: the extent to which the value I find in my training comes from community. Certainly, for me, as an essentially introverted person, it initially appeared as a sense of being accepted and included by others in a mutually pleasurable activity. In this sense, I suppose it was probably no different than the experience of joining any group organized around a hobby or recreation, and what I got from it could have easily been found elsewhere. Over time this experience shifted and became more nuanced. Again, some of this would probably have been the same in any group: as I put in time, developed individual relationships with my teachers and fellow students, the feeling of belonging to something larger than my own pleasure or interest increased. There are aspects of this dynamic, however, which I do not believe could be found elsewhere, or at least only in a minority of other contexts. One is the degree to which what we do is founded of necessity on trust: trusting our teachers and their skill at conveying authentic teachings; trust in the teachings, and the techniques in which they are embodied; trust in our fellow students to provide us with opportunities to learn correctly and to keep us safe while we train; and finally, trust in our own ability to learn and improve. I have not experienced this in any other community of which I’ve been a part, at least since childhood and probably not ever. Another aspect of community that has helped keep me on the path to my black belt is that my own learning has necessarily involved helping others to learn. The mutuality of learning was not immediately apparent to me. As someone with an academic background and more than a decade’s worth of experience teaching in a classroom, I found myself slipping into one of two positions: either the supplicant student, telegraphing to my teacher and fellow students my eagerness to learn, or (as I gained experience and confidence in my technique) the knowing mentor. I have to admit that in my moments of awareness, both of these attitudes made me cringe. It took a long, long time for me to come to understand that my willingness to learn didn’t make me better than others, though it helped me improve my techniques, and that I could help others without becoming a know-it-all in the process. 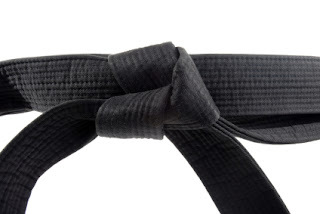 And I also learned (and this, in my estimation, is crucial) that others could help me learn, regardless of what colored belt they wore, and that helping others played a huge part in improving my own technique. I also discovered that the more I made myself available to those I trained with, by encouraging them and revealing the areas in which I had the most work to do, the more I felt a part of a community. In Kung Fu, Caine’s wanderings through the 19th century American frontier bring him face to face with conflict again and again. When conflict rises to violence, he uses his wu shu techniques as he was taught by his masters: “Avoid rather than check; check rather than block; block rather than strike; strike rather than hurt; hurt rather than maim; maim rather than kill—for all life is precious, and none can be replaced.” But what I sensed only dimly as a child is a deeper and more important consequence of that ability: he comes to conflict calmly, neither denying that it exists nor doing anything in his power to avoid it. And that equanimity in the face of conflict was often enough (even given that the TV show format demanded x-number of exciting fight scenes per episode to keep viewers like me returning each week) to resolve the conflict. I wish I had understood earlier in my life that the ability to fight was less important than the ability to calmly face and accept whatever arose. But I am certain that I could not have understood that without my training: that the only way to get there was to travel this path. If you would like to see Marcus test for his Black Belt, join us on June 7 at 7:45pm. Everyone is invited to watch the test and there is no charge. Marcus's test is part of a weekend Copper Dagger event. Are you registered? Wow, Marcus! Beautifully written and told. Thanks for sharing the story of your journey. We'll be there on June 7.